But despite the popularity of "Netflix and chill" at-home streaming sessions, some filmgoers say the romance is far from dead: at one rural spot in Virginia, moviegoers looking for a trip down memory lane can get their fill of popcorn while enjoying a double feature under the stars. 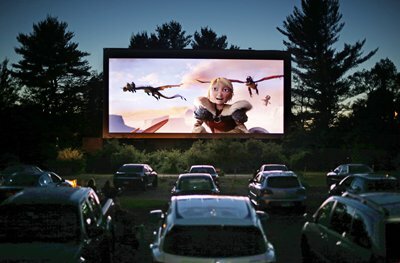 Patrons can view the big screen from the privacy of their cars - perfect for the yawn-and-stretch move - or outside for a "tailgate" party of the sorts that sees adults chit-chatting over snacks as kids romp on the playground. The Family Drive-In Theater in Stephens City - 84 miles (135 kilometers) west of Washington - is one of just 300 drive-ins still in operation stateside, down from 4,000 such cinemas in the 1960s when the concept peaked, becoming intrinsic to the fabric of classic Americana. Two films cost $8 and kids get in half-price at the dog-friendly venue, which opened in 1956 and is now the only drive-in left in the region. Perched on her family's 1968 Bronco truck for a showing of Black Panther, Crittenden says heading to the drive-in "seems like a special occasion."